The Borja Family: Book Review: For Grown-ups! I had heard quite a bit about Colton Burpo's trip to heaven and back and had to read about it for myself. 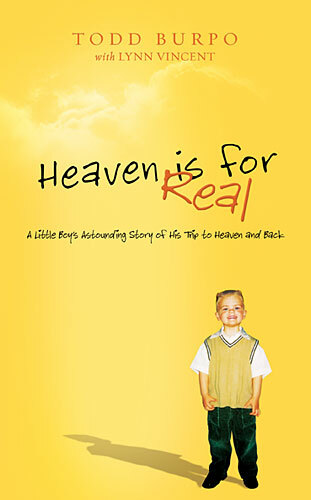 I had requested the book Heaven is for Real, written by his father, a few months ago from our library and was on a long waiting list. Anyways, I got the book yesterday and began reading it after breakfast this morning and literally could not put the book down. I read the whole thing in about three hours. Nathan was down for his nap so that helped, and Tim sat on the couch with his library books and a juice box for quite some time. If we could have gotten rid of daddy I could have read it in two! It is very interesting, thought provoking to say the least, and charming for those of us who understand how the mind of an almost-three year old works. I think this would something fun to put in a gift basket. Grandpa Nick read the book before I did and he enjoyed it as well. He's the one who got me so curious, then when I saw it getting passed around at church I had to request it. Read it and let me know what you think.